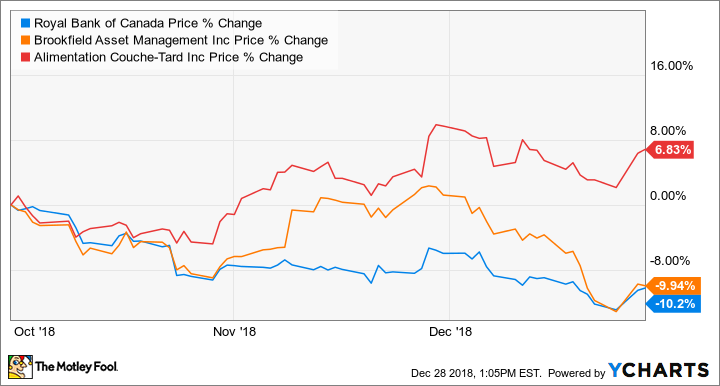 The top three stocks I suggest you buy for 2019 and beyond have proven business models and competitive advantages to maintain their leading positions. The market correction from October dragged down the valuations of two of these quality stocks, while one of them didn’t participate in the correction but actually showed strength and appreciated about 7% as of writing. Without further ado, here are my top three stocks to buy for 2019 and beyond. RY data by YCharts. The price action of TSX:RY, TSX:ATD.B, and TSX:BAM.A since October. The top three stocks I suggest you buy for 2019 and beyond have proven business models and competitive advantages to maintain their leading positions. The market correction from October dragged down the valuations of two of these quality stocks, while one of them didn’t participate in the correction but actually showed strength and appreciated about 7% as of writing. Without further ado, here are my top three stocks to buy for 2019 and beyond. Brookfield Asset Management (TSX:BAM.A)(NYSE:BAM) is a global alternative asset manager that has 115 years of experience owning, operating, and investing in real assets. It manages and owns huge stakes in its subsidiaries, including Brookfield Property Partners, Brookfield Infrastructure Partners, Brookfield Renewable Partners, and Brookfield Business Partners. The advantage in owning the parent, BAM, is that you get to own a piece of all of its subsidiaries by simply investing in BAM stock. Furthermore, BAM generates increasing management fees and receives increasing carried interest, respectively, as its fee-bearing capital grows and it provides expertise to grow the subsidiaries. BAM has, in fact, increased its annualized fees and target carried interest at a superb compound annual growth rate of about 24% in the past four years or so. The growth is set to continue. BAM has simply outperformed. It delivered long-term returns of about 14% per year, while in the same period, the U.S. market delivered returns of about 5% per year. While most other stocks are trading meaningfully lower compared to their levels in October, Alimentation Couche Tard (TSX:ATD.B) stock is actually trading about 7% higher. Couche Tard has been a consolidator in the global convenience store space. Its track record is amazingly profitable: its five-year return on assets, return on equity, and return on invested capital are high at 8.9%, 23.5%, and 14.7%, respectively. Couche Tard outperforms. It delivered long-term returns of about 24% per year, while in the same period, the U.S. market delivered returns of about 8% per year. Most importantly, at below $68 per share, Couche Tard is still a good value. It trades at a forward price-to-earnings ratio of about 15.3, while it’s estimated to increase its earnings per share by at least 12% per year on average over the next three to five years. Couche Tard is also good at increasing its dividend. Its 10-year dividend-growth rate is about 25%. Imagine increasing your regular income by more than eight times in a decade! That’s what Couche Tard did for its dividend. Royal Bank of Canada (TSX:RY)(NYSE:RY) is one of the leading banks in Canada, and it’ll continue to lead well into the future. It’s a top 10 bank globally and has operations in 36 countries, but it has a focus in Canada and the United States. Specifically, Royal Bank generates about 61% of its sales in Canada, 23% in the U.S., and 16% internationally. In the U.S., it aims to be the preferred partner to corporate, institutional, and high net worth clients and their businesses. In the past five years, Royal Bank increased its earnings per share at a compound annual growth rate of about 8.7%. Its return on equity was well above 17% in fiscal 2018. You can also rely on Royal Bank’s safe dividend. It has increased its dividend at a compound annual growth rate of about 7% since 2008, despite the slowdown of the growth from frozen dividends from 2008-2010. At under $93 per share as of writing, Royal Bank offers a decent 4.2% yield. It can potentially increase its dividend per share by about 8% per year based on estimated earnings-per-share growth of 8% per year on average over the next three to five years. Long-term investors looking for profitable businesses to buy at a good price won’t be disappointed by buying Brookfield Asset Management, Couche Tard, and Royal Bank today. You’ll get an increasing income, too! Want more long-term Foolish ideas? Check these out. Fool contributor Kay Ng owns shares of ALIMENTATION COUCHE-TARD INC, BROOKFIELD ASSET MANAGEMENT INC. CL.A LV, Brookfield Business Partners L.P. Limited Partnership Units, Brookfield Infrastructure Partners, Brookfield Property Partners, and Brookfield Renewable Partners. The Motley Fool owns shares of Brookfield Asset Management, BROOKFIELD ASSET MANAGEMENT INC. CL.A LV, and BROOKFIELD BUSINESS PARTNERS LP. Couche Tard is a recommendation of Stock Advisor Canada. Brookfield Renewable is a recommendation of Dividend Investor Canada.